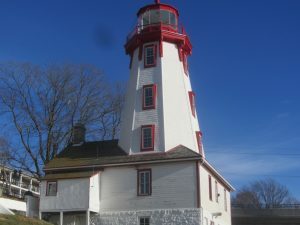 The light at the Kincardine Lighthouse has been extinguished! It was taken out of service Thursday, Aug. 17 in preparation for the restoration of the light enclosure. On Thursday, August 10, tours at the Lighthouse were shut down for the 2017 season. The next days were spent removing all artefacts from the tower and the shipwreck room, and safely storing them. 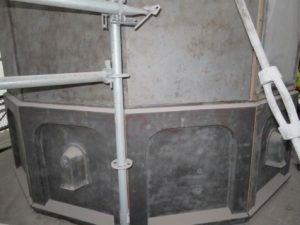 The fog horn controls were removed from the top of the lighthouse and temporarily installed in the basement. 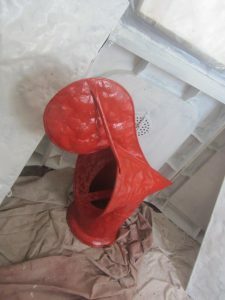 The light will be removed as well and safely stored until the end of the project. Fencing was installed around the lighthouse on Monday, August 21, and scaffolding is now being installed to the top of the tower. The lighthouse is posted as a construction zone, and access to the lighthouse for KYC members is restricted. 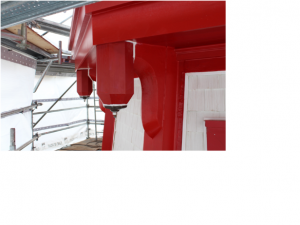 This project will completely refurbish the lantern room on the top of the lighthouse, eliminating leaks, and inspecting all connecting hardware. 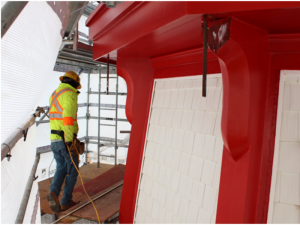 all tower windows will be realigned to a vertical position, with rain hoods installed as per original. This restoration project has been awarded to Phoenix Restoration and is scheduled to be complete by November 3, 2017. 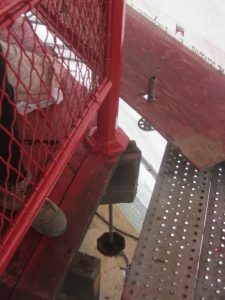 Scaffolding on the Lighthouse tower was completed Sept 5. 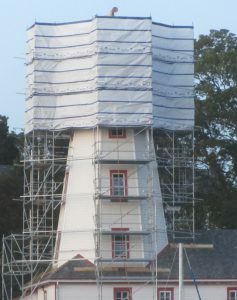 By the end of the day, Sept 6, the scaffolding around the top portion surrounding the light enclosure was enclosed, so that restoration work could proceed. By early October, most of the paint on the light enclosure has been removed, by scraping and sand blasting. As seen below, the condition of the metal is good with some pitting observed. On October 14, I toured the lighthouse with Alanna Brannigan, who is in charge of the restoration for Phoenix. 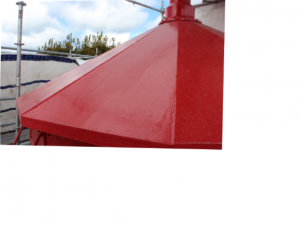 A lot of work has been completed on the project, the red has been painted on the outside of the light enclosure, and the wind vane is ready to be reinstalled. However, the project is slightly behind the schedule completion date of Nov. 3, due to the amount of discovery work. The wood of the deck outside is not in very good shape, nor are metal tie rods and the wooden supports under the deck. After all, they are probably 137 years old. 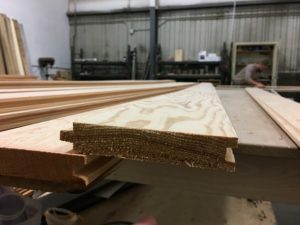 Replacement wood for the deck is being made, and the metal tie rods and the wooden supports will be replaced as well. Work is continuing, and hopefully the recent good weather will continue so that this project will be completed without any weather delays. A lot has happened in the last two weeks. The light enclosure has been painted. As you can see from the photo, the roof is looking in great shape. 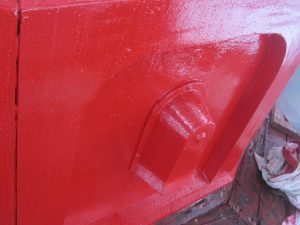 In addition, the ‘knuckles’ have all been fabricated, painted and installed. 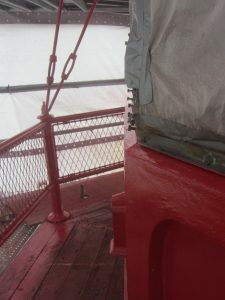 Work is proceeding on the outside deck and the tower windows. 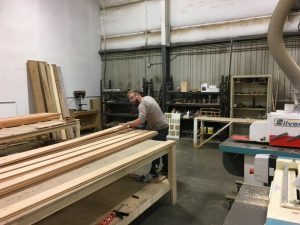 The project is nearing completion. The Kincardine Lighthouse Restoration is now complete. The light was powered up on Monday, Dec 4, 2017. Work included complete restoration of the light enclosure, inside and out, and repositioning of the tower windows. 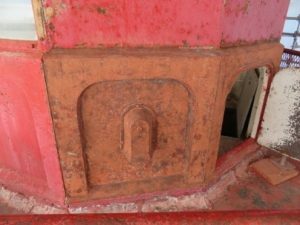 As the Lighthouse foundation was repaired in 2014, all that is now left is restoration of the keeper’s house, to be scheduled in the near future!